Cox Automotive Canada has developed a platform to run digital auctions for clients. 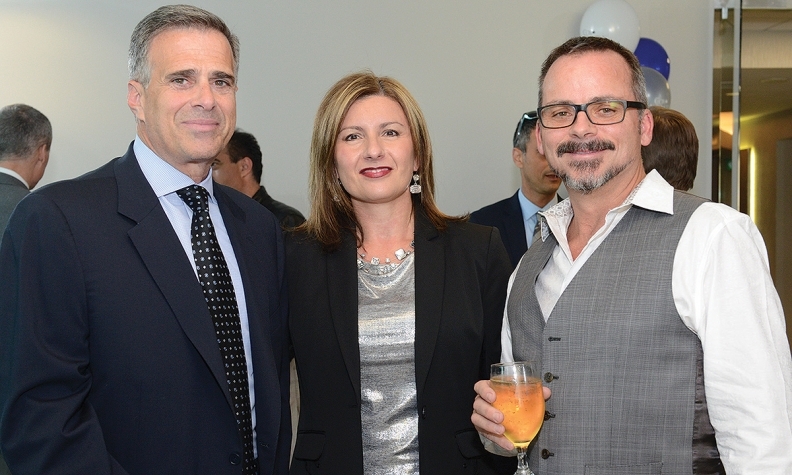 From left, Joe Luppino and Maria Soklis from Cox Automotive Canada, and Darren Graham, owner of Applewood Motor Group, during the opening of Cox's new Vancouver office. NEW WESTMINSTER, B.C. — The high cost of real estate in Vancouver’s Lower Mainland has driven Cox Automotive Canada (CAC) to devise a digital alternative to the traditional auto auction, one that does not require the purchase of expensive land and buildings to house vehicles, buyers and sellers. Cox has developed a platform to run digital auctions for a broad range of clients, from OEMs to large and small dealers and dealer groups, and even specialty players such as electric-car maker Tesla, says Maria Soklis, president of Cox’s Canadian operation. “It’s turn-key to save them (clients) time and money, which is what we all want, isn’t it?” says Soklis, formerly the chief operating officer at Kia Canada. Soklis joined Cox about 18 months ago to lead CAC. Soklis says that speedy online auctions make perfect sense. It significantly reduces land-acquisition costs and greatly cuts transportation expenses by eliminating the actual physical auction space, along with the movement of vehicles to and from it. Vehicle history and related material is posted online. Dealers bid and sales are concluded online. Sold vehicles are picked up from sellers and delivered to buyers. Cox acts as a digital facilitator and logistics provider for the auction, Soklis said. Cox developed processes and relationships that create trust and understanding between buyers and sellers. This digital auction is being pioneered in Canada; it will likely be rolled out in other markets. Cox in Canada is putting a great deal of focus on growing its Manheim Auction business; it generates significant revenue in a Canadian “house of brands” that has grown to about 800 employees. Through Manheim, Cox now provides coast-to-coast auction services in Canada. Cox recently bought out its auction partner in Edmonton and has consolidated its Quebec City hub, completing a national auction footprint. This year Manheim in Canada is on track to sell 80,000 vehicles, which is a 20 per cent jump from 2015. Auctions are just a part of an aggressive business plan. Cox in Canada houses only a fraction of the 25 global brands of parent Cox Automotive that’s based in Atlanta, Ga.
More brands and new initiatives are coming, says Soklis. While Cox is in essence a multi-brand dealer-services company, its activities are really quite easy to understand. There are four pillars, says Soklis, who adds that the company is pursuing opportunities in all four areas: 1) inventory services, such as auctions; 2) retail services, such as Dealertrack with its digital retailing and lending tools for dealers; 3) financial services, which includes NextGear Capital; 4) media, including trader.ca and dealer.com. Soklis points out that the Canadian operation reports to the International arm of the parent company. This allows CAC to draw on solutions from Cox divisions in the United Kingdom, Australia and elsewhere, which are markets that often more closely resemble Canada than the United States. The long-range goal at CAC is to be the premier dealer “solutions” provider in Canada. “We want to make everything easy for them [dealer customers],” she says.